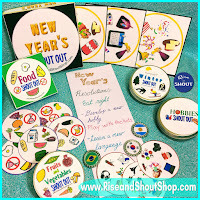 Rise and Shout: Shout Out for New Year's! Shout Out for New Year's! Happy New Year! I can't believe how quickly 2016 has flown by! Wow! Do you set goals for the New Year? Do you have kids that you want to teach the importance of setting goals? Did you know Shout Out can help? Beyond using New Year's Shout Out at your party to keep your family and guests having fun racing to find matches, you can use Shout Out to encourage new and good habits. Food and Fruits &Vegetables Shout Out encourage good eating for the New Year. Looking to learn something new? 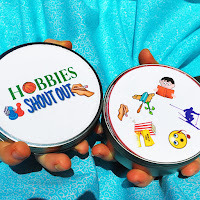 Hobbies Shout Out is loaded with ideas ... including fun sports and exercise. Thinking of traveling abroad? Or have always wanted to learn a language? Many of the Shout Out games are a terrific way to review vocabulary in any language. Looking to spend more time with the kids? Shout Out games can help. So quick and easy to set up, play and clean up, they are the perfect thing to pull out anytime -- at home, in the car, at a restaurant, waiting in line. A great way to have fun and interact with your kids, whether you have 2 minutes or an hour. Once you start, you can't stop. To play Shout Out, each person gets a card. The remaining cards are placed face up in a pile. Each card has one, and only one match, with every other card. Compare your card to the pile to find your match and shout out when you find it. The first person to find the match takes the card. Collect the most cards to win. Bet you can't play just one round! Shout Out Games come in 3" and 5" cards that can be cut into circles or squares. They also include printable storage and gift boxes.